DSMenu allows you to easily create captivating, professional menu boards with a simple, yet powerful drag-and-drop interface. With the DSMenu App for Enplug, you can integrate DSMenu with your Enplug displays to create and showcase your digital menu boards. 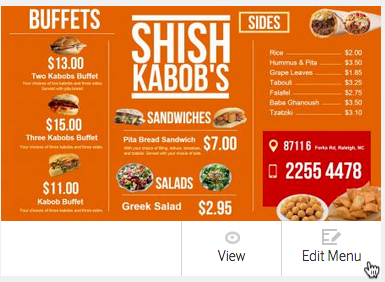 This guide will walk you through setting up an example menu board. To use this app, you’ll need a Standard or Pro DSMenu subscription. Learn more about DSMenu’s subscription plans on their pricing page. You can create a menu in two ways. You can create a new one from scratch or select one from the gallery and edit it to fit your needs. I’ll show you how to edit one of the dozens of stunning pre-designed menus available in the gallery. When you're done, click Save, Publish, and then My Menuboard. Under My Menuboard copy the Public URL of your menu board. You'll need this to set it up on your Enplug Dashboard. Click the Apps dropdown, then the Explore Apps section to select the DSMenu app from the list of apps. Paste in your menu's Public Board, and a name for your menu, and click Save. Your menu board is now live! Note that you may not have turned the app on yet! To turn the News app on, click the switch in the upper right corner. If you update your menu, you need to disable and re-enable the DSMenu app from your Enplug Dashboard to refresh it.